Back in January, Peter Bruzzese, author of “Tricks of the Vista Masters” contacted me about the “DPI setting” blog post I had about Windows Vista. He was interested in quoting a bit of my post for his book, and of course I agreed in quest for my superstar status. Today I inched a little bit closer to fame when I got a copy of Peter’s book for review. Having mentioned my neglect to read books, I can’t wait for the action-thriller, “Tricks of the Vista Master – The fellow of the masters” movie adaptation. Out of the 350-or-so odd pages, I was quick to find the DPI section with my quote in it. I thought I should follow in Google’s footsteps and scan the page to give you a better idea of what the book’s about. I feel honored by the title, but I should point out my bank unfortunately does not cash “respect”. I find the book very diverse in the topics it covers because of the number of contributors sourced, but it also means not every topic is as in-depth as it should be. However in return, additional links and places of interests make up for the more complicated topics. On a side note, it icked me a little to find most screenshots still using the “Vista Basic” UI theme whilst some used Aero Glass. Granted books do not have pixel shaders so I’ll forgive them for that. It wouldn’t be fair for me to judge this book since I’ve already read probably too many blogs and help files to begin with. But certainly it would be a great resource for someone who hasn’t been living and breathing Vista for the last couple of years. 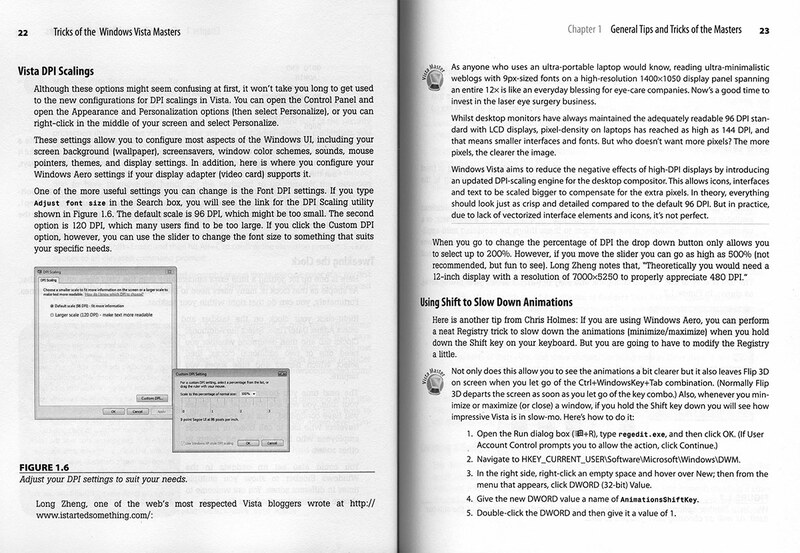 And to end on that note, I’m going to giving away my copy of the “Tricks of the Microsoft Windows Vista Masters” book by Peter Bruzzese. To be eligible to win, please reply in a comment with your name, email and the answer* to “What resolution would you need on a 12” display to properly appreciate 480 DPI?” The answer can be found in the picture above. The winner will be contact before the 8th of June, 2007 by email. Cash bribes accepted. * Users using a 28.8k modem or text-only browser are exempt from the above requirement. Update: The winner selected at random picked by a randomly selected person on my instant messengers list is Pharod. To everyone else, you’re all winners to me. Keith Carey, [email protected], and the answer is 7000×5250. Congrats on being quoted in the book! 7000×5250 HD is so confusing. On a side note, congratulations on being one of the masters of the universe. Keep the book, you need to read it! You’re missing out on so much by not reading books. Saying that though, if you were so inclined to give it away despite my advice… the answer is 7000×5250. Normally, I would bribe… but I’m probably just as poor as you are. He he. I’m also interested in the next section about using the shift key to slow down animations. I thought that didn’t work since the RC releases? But the real question is, by what ratio would the amount of appreciability between 480 DPI and 96 DPI be? 7000×5250; 4th paragraph of the page at the right side.